The continuation of active motility of the antrum after SPV can best be demonstrated by X-ray cinematography (Lissner, Holle et al., 1972); the same is true of adynamia of the antrum after selective distal denervation of the stomach or after truncal vagotomy. After pylorectomy or open or submucosal pyloroplasty, even without drainage measures, more or less severe postprandial disturbances having the character of dumping are clinically observed. Usually no correlated finding can be substantiated radioscopically. According to Wilbur and Kelly (1973), SPV alters the emptying process in a typical fashion. Corroborating our own opinion (cf. p. 124, 1–4) of the different quality of stimulus apperception in the proximal and distal stomach, Wilbur and Kelly state that such functional diversity also exists with reference to the emptying of the stomach. The transmural pressure upon filling or emptying is controlled and the emptying of liquids is regulated through the vagal afferent elements of the proximal stomach. The pressure in the antrum is registered in the antrum and the emptying of the solid boli is regulated through the afferent elements of the distal stomach. It was shown radiologically in dogs (Klempa et al., 1971; Wilbur et al., 1973) that the motility and emptying of the stomach are less disturbed after SPV than after selective, gastrically complete, or truncal vagotomy. 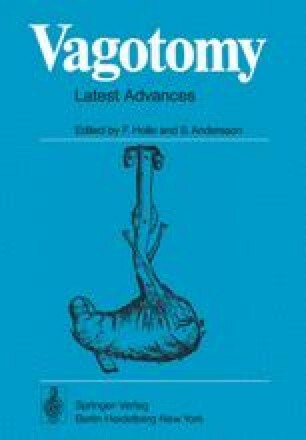 Although with all three forms of vagotomy there is increased transmural pressure as the result of enlarged distention, and there is rapid emptying of liquids, the solid components are, however, emptied more slowly. Acceleration of liquid emptying after vagotomy of any type is also present when no drainage has been made and the pylorus remains intact. Complaints of dumping after vagotomy must accordingly be regarded as predominantly “liquid dumping”. The idea that dumping of any kind can be avoided by omitting pyloroplasty must be revised. SPV with pyloroplasty does, after all, assure an almost regular emptying process for the stomach content which is chewed completely.